Japanese architecture never ceases to amaze us, and when it is modern Japanese architecture, an additional layer of nuance comes into the picture. 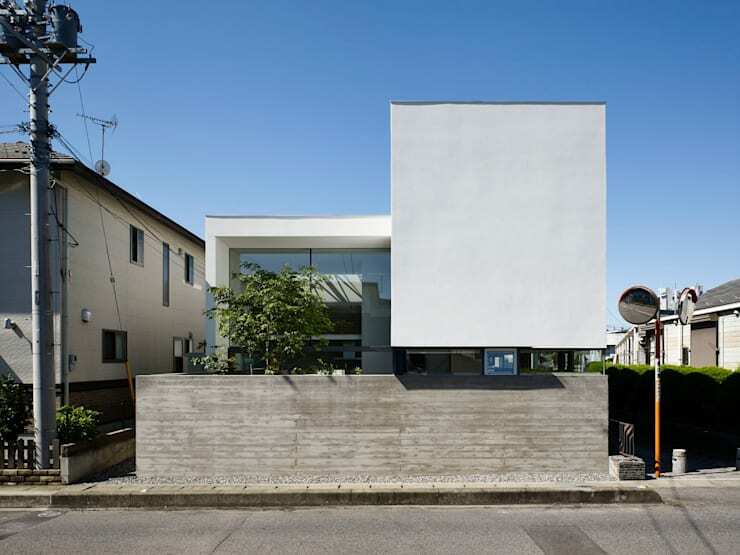 The architects of the house we are looking at today, Shin Onozato, have combined the Japanese love for minimalism with unique elements of modernism. So you won't find any of those cliched Buddha statues or bamboo folding walls; instead the architects keep it breezy and simple while experimenting with geometry and textures. One of the cool things about the property is how the architects, by building vertically, managed to use a 66-square-metre plot and convert that into a 112 square-metre living space. If you walk by the residential area that it is housed in, rest assured the facade is going to make you do a double take. But this isn't a house that is going in for shock value, but one that is subtle and understated in its appeal. It holds tight to balance, order and a love for natural beauty. At first glance, the place looks almost a tad foreboding—with its grey concrete base and the white cube on one side. It could also easily be mistaken for an abstract art installation but perhaps that works in favour of the architects, because hey, artistic endeavour and all that. A closer look, though, reveals the large glass front and the inviting greens that hint toward the welcoming vibe indoors. The play between soft and harsh textures incidentally is an important aspect of Asian architecture. Since the architects only had a limited space to work with, a split-level, open-plan approach was taken in order to create as much living space as possible. The functional areas are neatly separated by unobtrusive pillars, a small flight of stairs and even clearly camouflaged storage cabinets, and consequently, give the impression of a spacious and airy space that is connected from all sides. Ah, the things you can do if you put your creativity to good use! If you're looking for professional help to build your dream home, it's all right here. Also, would you check out that natural light pouring in through here! This is the space underneath the white cube, which smartly shields the residents from passers-by while letting in unobstructed sunlight. You are going to want to relax here and then some. 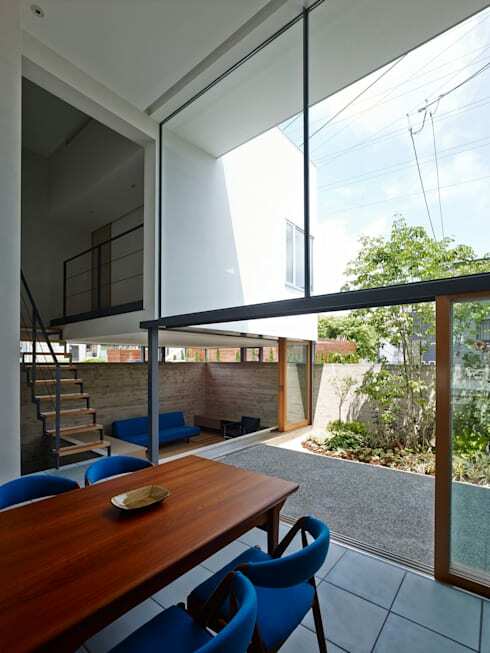 A garden, or in this case, a courtyard, is usually the farthest thing from your mind when you have to work with smaller spaces, but Shin Onozato simply decided to keep the living and dining spaces closer to the entrance while making room for a small courtyard. The large glass windows keep a harmonious flow between the interior and outdoor space. In this way, nature is brought indoors. 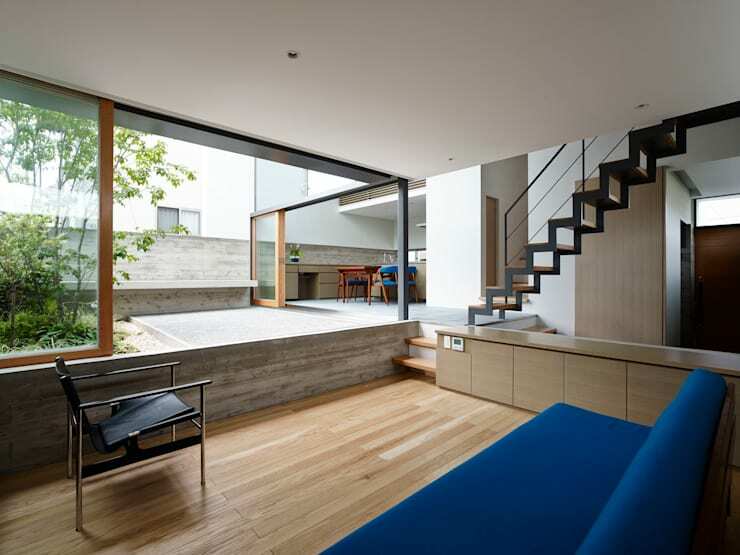 Another impressive feat achieved by the architects is to include concrete in the interior decor and actually make it look trendy in that non-industrial-chic fashion. Major props for that. It was important for the owners of the house, being voracious readers, to have a comfortable reading nook that would also double up a study. 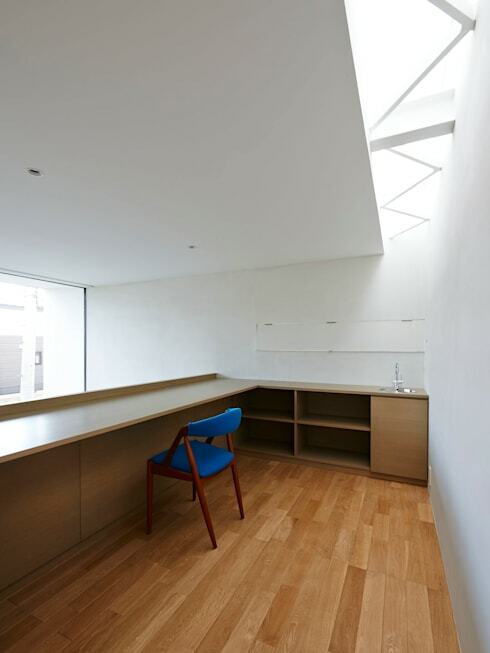 In addition to the bedroom on the second level is this super minimalist study that has large skylights flooding the room with natural sunlight, allowing for long hours of reading without having to switch on a light. Yes please! Come nighttime, and the house becomes even more striking and abstract. It truly stands apart in a neighbourhood of standard, assembly-line houses. It is only when the sun goes down, and lights in the house come on that the narrow stretch of the glass window running along and between the cube and the concrete base becomes apparent. The effect is quite captivating. In the end, it's a creative way to keep prying eyes out in the daytime while ensuring a unique look and feel in the evenings. 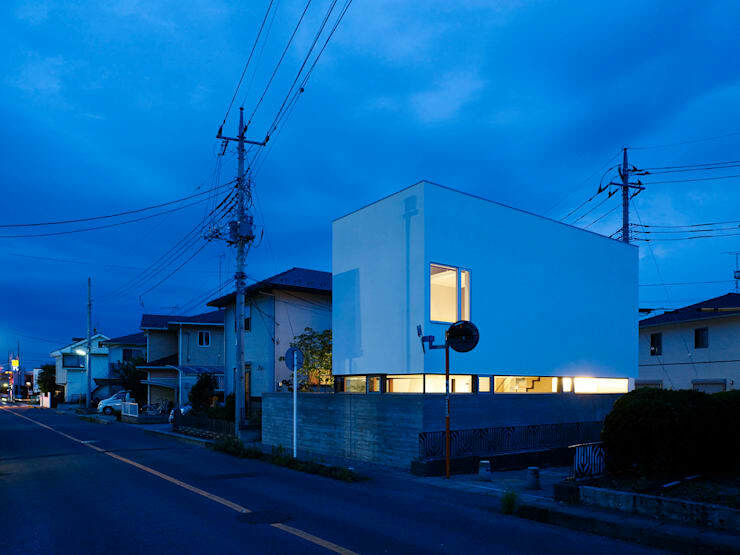 Check out what creativity can achieve with a small space here: A slender home of Japanese innovation. What did you think of this unusual home? Yes or no? Let us know in the comments!